Even in the midst of this season of epic winter cold, it’s a busy time at Miniwanca. Since the beginning of 2019, Miniwanca has already traveled to two cities, hosting open houses in Chicago and St. Louis. In both cities, the Miniwanca program team enjoyed meeting many new and returning camper families at three open houses hosted by the Thornton, Hannam, and Grundy families. Thank you to all the families who attended, and in particular we’d like to offer some gratitude to the three families who hosted these events. In St. Louis, we were also excited to visit City Academy and the Danforth Scholars, both Community and School Groups that come to camp during our spring and fall seasons. At City Academy, Tiwi and Chelsea were able to answer many important questions from parents and students as they anticipate their first ever visit to camp in April. Hannah and Andrew spent some time with the Danforth Scholars in the hopes of recruiting some interested and interesting adults to work in our summer camp communities. If all this talk of house parties and events intrigues you and you’re interested in connecting with us, the Miniwanca team has already planned several more events where you can reconnect with camp, learn more about our programs, and share the joy of Miniwanca with others. You can join us in Shaker Heights, outside of Cleveland, on February 9th from 3:00 – 5:00 PM. There you can meet longtime camp family, the von der Heydts, as well as Liz Marshall, the Director of Camp Programs. 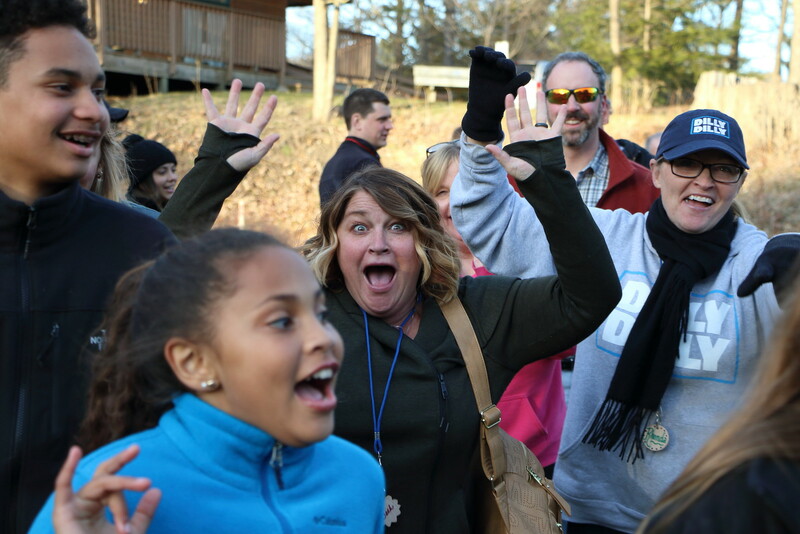 Tyler “Tiwi” Freeman, the Boys Camp Director, and Hannah Patterson, the Girls Camp Director, will be traveling to Mason, outside of Lansing, and Bloomfield Hills, outside of Detroit, the weekend of February 23 and 24. Both events will take place between 2:00 and 4:00 PM. If the Miniwanca team isn’t traveling near you this winter, you have the opportunity to come see us in the spring! Volunteer Weekend is a free weekend program happening April 26-28 this year. Alumni, family, campers, and friends will all travel to the shores of Lake Michigan to join the team at Miniwanca and help open up the site! Friday night is a chance to connect and meet everyone who attends. 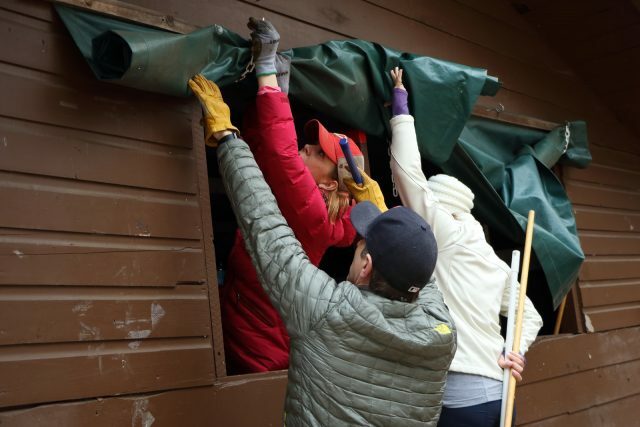 On Saturday we’ll dig into the work: raking leaves and opening cabins, pulling up snow fencing, preparing the garden for spring, making granola and torches, and even some high skill projects like roofing or stair building. Young ones can also enjoy the day on Saturday with age-appropriate service projects and games in Kids Camp (ages 4-8) and Adventure Camp (ages 9-13). Saturday afternoon and evening we’ll have our first optional Polar Bear Plunge and Council Circle of the year! 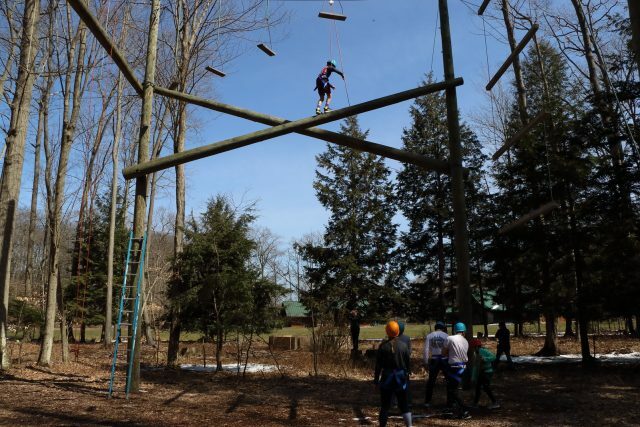 Sunday winds down with a closing activity and a chance to climb the high ropes course. Registration opens for Volunteer Weekend on February 4 and space is limited. Come out and connect with us. We’d love to see you!